The West is full of larger-than-life figures whose stories are as vast as the land they inhabited. From Annie Oakley to Calamity Jane, these women have undergone a mythic transformation through such popular culture mediums as song, stage, and film. The story of Margaret Tobin Brown is no exception. She used her wealth to transcended gender roles and social limitations to proactively improve the world around her. Perhaps coming of age in the west allowed Margaret Brown a freedom not enjoyed by women back east, allowing her to run for US Senate, champion labor reform, and help create a juvenile justice system. So much of what we think we know about Margaret Brown comes from the larger-than-life stories that were created after her death in 1932. 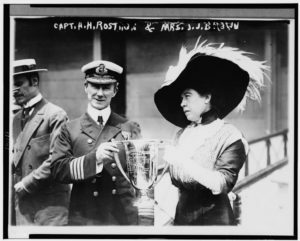 From floating down the Mississippi River as a baby to commanding her Titanic lifeboat using a Colt gun, many tall-tales have been spun about her life. After her death, the story of Margaret Brown, though well documented while alive, immediately began to transform as a culture searching for quickly receding great western stories set her adrift as an uneducated, unaccepted figure. One year after Margaret Brown’s death, Gene Fowler, a “wisecracking Denver reporter known for his ability to spice up a story,” wrote about the life of “Molly Brown”. Influenced by the Rocky Mountain Times obituary, Fowler helped create much of the myth we know today. Fowler wrote that she was born during a tornado and that her impoverished father was a drunkard (neither of which was of course true). He also wrote that she couldn’t read or write. His story became the basis for the play written by Richard Morris and Meredith Wilson, The Unsinkable Molly Brown. What are some of the most common myths surrounding Margaret “Molly” Brown? Keep reading to find out! The biggest myth is, perhaps, that she was called “Molly”. In her life, Margaret never went by Molly. When she was young she was called Maggie and as she got older, Margaret. Once she was married she was known as Mrs. J.J. Brown. The story of “Molly” began in the 1930s, as described above, with the colorful pen of Denver Post reporter Gene Fowler, who created a folk tale, and sensationalist writer Carolyn Bancroft, who wrote a highly fictional account for a romance magazine. 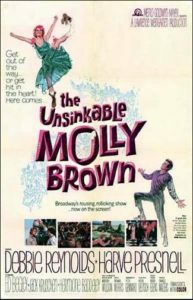 This story enjoyed various radio broadcasts during the 1940s and was the basis for the Broadway play, The Unsinkable Molly Brown which became the MGM movie of the same name, starring Debbie Reynolds. Even Kathy Bates’ portrayal in James Cameron’s Titanic has very little to do with the real story of Margaret Tobin Brown. Myth: She grew up playing with Mark Twain, and was, in fact, rescued by him from drowning in the Mississippi River. Mark Twain, born Samuel Clemens, is perhaps Hannibal, Missouri’s most famous figure. However, Twain and Margaret most likely never met or knew each other. Twain left Hannibal in 1853, 14 years before Margaret was born. He returned to Hannibal in 1868/69 as a part of his lecture tour. Legend has it that he stayed at the Park Hotel where “Molly” was working as a waitress at the time. He also returned to Hannibal for a visit in 1885, however, it is unlikely they met then either. Myth: She worked in a hotel in Hannibal and was a rough and tumble saloon girl when she moved to Leadville. 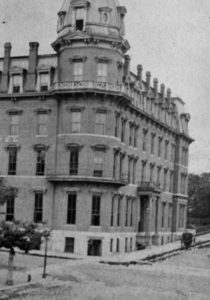 According to lore, at the age of 13 (or 15 depending on who was telling the story), “Molly” got a job working as a waitress at the Park Hotel and begged to serve Mark Twain during his stay there because she adored famous people. He supposedly told her of the mining camps in California and Colorado and urged her to head West to Leadville to find a rich man to marry. In reality, after finishing school, Margaret went to work stripping tobacco leaves at Garth’s Tobacco Company in Hannibal, Missouri. When she was 18, she boarded a train for Leadville along with her sister Helen (who was just coming to visit). Margaret and Helen’s sister Mary Ann, her husband, and their brother Daniel had moved to Leadville earlier. During a popular scene of The Unsinkable Molly Brown movie. “Molly” works as a saloon girl in Leadville and sings “Belly Up to the Bar Boys!”. This is a well-known myth about “Molly,” however, Margaret Brown never worked in a saloon and was in fact an early supporter of the prohibition movement. When Margaret arrived in Leadville she initially kept house for her brother Daniel who was working as a day miner. Shortly after arriving she began to look for something more “ambitious” to do. She went to work for Daniels, Fisher & Smith dry goods store in the carpet and drapery department, sewing draperies, carpets, and shades. Myth: She and JJ made their fortune prospecting and became millionaires overnight. JJ was a mine engineer, not a prospector. JJ was one of the owners of the Ibex Mining Company which owned the Little Johnny Mine. In 1893, JJ was appointed superintendent of all of the Ibex properties. That same year, the company decided to try mining the Little Jonny Mine again, but for gold this time, instead of silver (which is what most people in the area were mining at the time). The miners hit a layer of sand which was making it impossible to drive a shaft into the mine. JJ came up with a simple, yet ingenious solution to use hay bales and timber to hold the sand back. 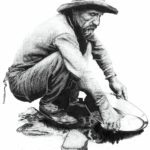 As luck would have it, JJ and his miners found the largest vein of gold ever discovered in North America up to that time. JJ was awarded over 12,000 shares in the company and a seat on the board of directors. Within a short time, JJ and Margaret were multi-millionaires. Caroline Bancroft spread the story of how “Molly” burned money in her stove in Leadville. Paper money was not used in the camps. Margaret admitted to keeping coins in the stove, but she certainly never burned their fortune. While Margaret and JJ were not often invited to socialize with the upper echelons of Denver’s wealthy society because of their new money status, they were by no means disliked or snubbed. If this had been the case, Margaret would have been terribly unsuccessful at fundraising (when quite the opposite is true). However, she successfully raised funds to help build the Cathedral of Immaculate Conception, for the expansion of St. Joseph’s Hospital, for the creation of more playgrounds to help keep kids off of the streets and out of trouble, and for the founding of the Denver Dumb Friends League. Myth: She boarded her Titanic lifeboat wearing a $60,000 chinchilla opera cloak but quickly striped down to her corset, and waived her Colt gun at those who wouldn’t row. When the Titanic struck the iceberg, Margaret dressed quickly and warmly. She put on a black velvet suit, 7 pairs of stockings, a silk hooded cloak, and a sable stole. She put her good luck talisman and $500 in a po cket. Once on deck, Margaret helped load others into lifeboats and eventually was forced to board lifeboat six. Quartermaster Hichens was the only man in the lifeboat. He believed that women were useless and couldn’t row. Margaret took command and insisted that women be allowed to row to keep warm. She and the other women in lifeboat six worked together to row, keep spirits up, and dispel the gloom that was broadcast by the emotional and unstable Robert Hichens. Myth: She claimed to have won an award from the French government, but hadn’t really. 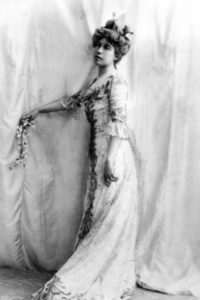 In 1932, Margaret was in fact awarded the French Legion of Honor for her “overall good citizenship,” which included helping organize the Alliance Francais, her ongoing work in raising funds for Titanic victims and crew, her work with Judge Ben Lindsey on the Juvenile Court of Denver, and her relief efforts during World War I. As you can see, while Margaret may not have had quite as adventurous life as “Molly,” her life was by no means boring! Margaret also worked for Women’s Suffrage, drove ambulances during WWI, and loved to travel around the world.